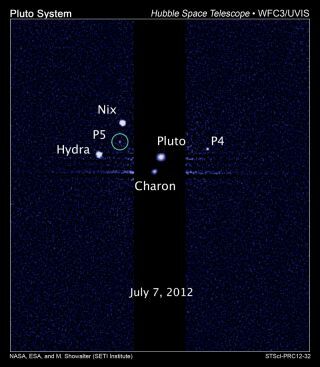 This image, taken by NASA's Hubble Space Telescope, shows five moons orbiting the distant, icy dwarf planet Pluto. The green circle marks the newly discovered moon, designated P5, as photographed by Hubble's Wide Field Camera 3 on July 7, 2012. If you've ever wanted to leave your mark on the heavens, here's your chance. Astronomers are asking for help in naming two newly discovered moons of Pluto, which currently go by the uninspired monikers P4 and P5. The tiny satellites were spotted by the Hubble Space Telescope in 2011 and 2012, respectively. Pluto's three other known moons — Charon, Nix and Hydra — are named for Greek mythological characters associated with the underworld. The short list of names that interested members of the public can vote on for the new moons follow that same pattern, researchers said. "The Greeks were great storytellers, and they have given us a colorful cast of characters to work with," Mark Showalter, a senior research scientist at the Search for Extraterrestrial Intelligence (SETI) Institute in Mountain View, Calif., said in a statement. You can vote to name the moons on plutorocks.com until noon EST (1700 GMT) on Feb. 25. Write-in ballots are also encouraged. P4 and P5 are both very small, with diameters of just 15 to 20 miles (20 to 30 kilometers). They were discovered by researchers associated with NASA's New Horizons mission, which is slated to fly by the dwarf planet in 2015. The team has been surveying Pluto and its environs for rings, small moons and other objects that might pose a danger to the fast-moving spacecraft. Pluto was discovered in 1930. Its planethood was thrown into question when the International Astronomical Union came up with a new definition of "planet" in 2006. That year, Pluto was demoted to the status of "dwarf planet," a newly created category to describe many other objects in the Kuiper Belt, the ring of icy bodies beyond Neptune. Charon is by far the largest of Pluto's moons, measuring 648 miles (1,043 km) across. Nix and Hydra range between 20 and 70 miles (32 to 113 km) wide.